Hi there! And welcome to our Soundcloud Plugin video. Now, onto the Soundcloud Plugin. This plugin allows you to sync any Soundcloud account you’d like by simply entering in the account link and your Client ID, which I’ll show you how to get later on in the video. After syncing it up, you’ll see a list of Soundcloud tracks populate that your users can play straight from their devices. Your users can try out your audio first before perhaps clicking on a link to your Soundcloud account here to follow you. 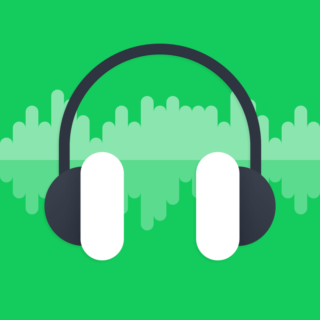 This is great if you produce music, podcast episodes, or conference talks that are hosted on Soundcloud. If you’d like to learn more about Soundcloud, check out their website at soundcloud.com. To add a Soundcloud plugin to your app, go to Plugins and Add Plugin. Search for the Soundcloud Plugin in the search field, click add, then name it. If you’d like to also add this plugin to your Side Menu, you can simply check this box. If not, no worries, we’ll go over how to add it to the Side Menu later on in the video. 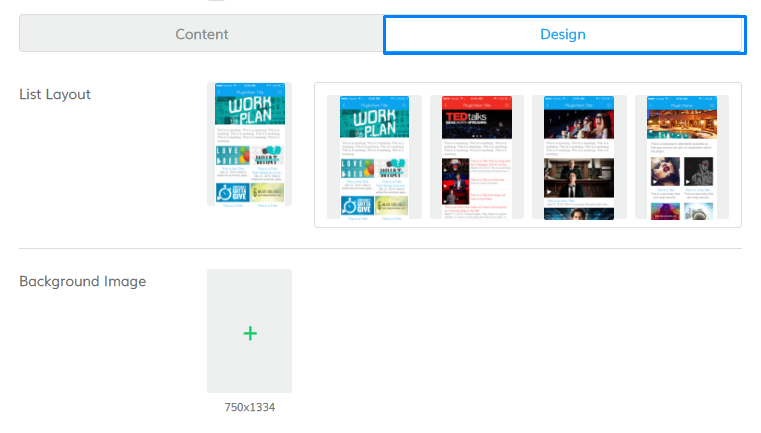 Once here you’ll see that there are 2 sections: Content and Design. Content is where you make changes to the stuff you put into the Soundcloud Plugin whereas Design is where you get too decide how that stuff looks. Let’s start with Content. There are 4 sections: Image Carousel, Description, Soundcloud Client ID, and Link. Under Image Carousel, just click Add Image. This will give you access to your Media Library. If you already have images uploaded, just select some, and click Insert Image(s). You can also click on Upload Image(s) to upload any images from your desktop to your Media Library. If you’d like to learn more about using the Media Library, just click here. The Description box is powered by our Text WYSIWYG plugin, which you can learn more about here. You can put a brief introduction to your sound clips here and maybe link to your SoundCloud, website, and social media accounts. To learn more, check out our Text WYSIWYG video here. 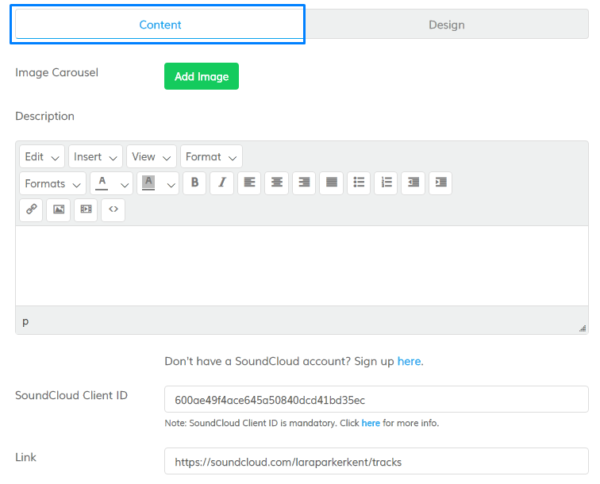 Soundcloud Client ID is a string of numbers of letters that will allow permission for the Soundcloud API to be accessed and used within your app. To get it, make sure you’re logged into your Soundcloud account, click on this link here, then click Register a new application. Input in your app’s name, take a look at their Developer’s Policies, check this box saying you’ve read them afterwards, then click Register. On the next page, you should find your Client ID here. Copy this string and paste it in the Plugin field. 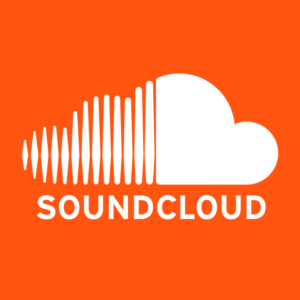 Under Link, copy and paste your Soundcloud account link here. It should be in the form of soundcloud.com*** forward slash your username. Click verify and within moments, your Soundcloud should appear in the Emulator screen. Let’s go to the Design tab now. Under the List Layout section, you can change the way your Soundcloud sounds are displayed. They can be in grid mode, list mode, full width mode, an a grid mode with square icons. Under background, you can access your Media Library again to insert a background into your Plugin. Be careful to choose one that won’t overpower the text in your Plugin. You still want your users to be able to read the titles of your sound clips! Along with the SoundCloud plugin, you can also add the Audio Media Player plugin. It will allow your users to control the music that is playing in their app. Pause, play, rewind, etc. With the audio player plugin, they can also create their own personal master playlist. To learn more about the Audio Player Plugin, check out this video here. And with that you’re all done with creating your Soundcloud Plugin! Don’t forget to click Publish to push out your changes. If you haven’t upgraded, please upgrade so that you can publish your changes. Congratulations! Your Soundcloud Plugin is now accessible within your app. Thank you so much for watching. Be sure to check out our other Help Videos and we’ll see you next time!